The Everything Wallet – tutorial! A few months ago I made myself a new wallet which is my “everything wallet” – meaning, I can keep all my purse junk corralled in one place: money, change , cards and receipts have their own places on one side, and things like tissues, medicine, pens and paper, and other health and beauty things have their own space on the other side. So you’ll need two fabrics, one main fabric and one contrast. I think you could get away with two fat quarters, but don’t take my word for it – buy half yards instead 😉 Plus you’ll need three zippers. Two of them have to be at least 18″ long; the third has to be at least 8″ long. You’ll also need a bit of velcro and a bit of elastic (about 8 inches of each). 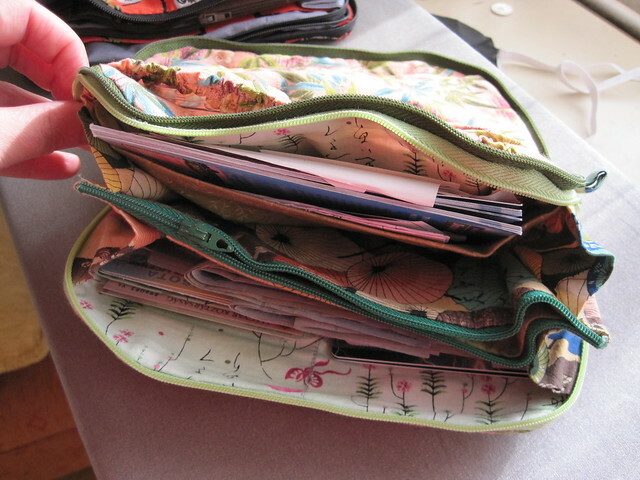 A sharp eye might notice that the outside of my bag (red piece at the bottom left) is pieced. Yeah, that was…. um, totally intentional. 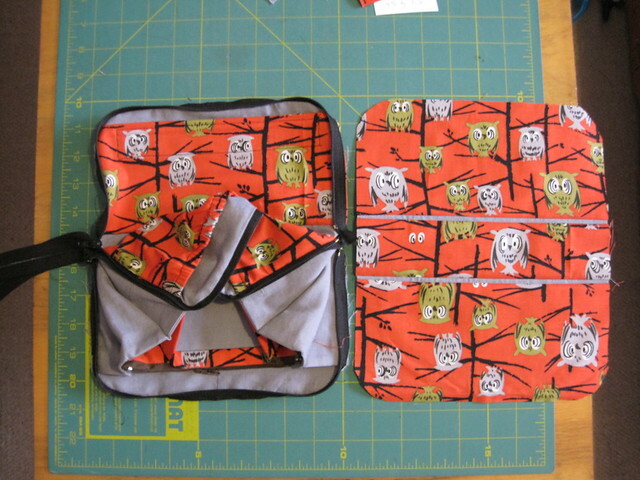 You know, so that the owls would be right sides up on both sides of the bag. And those gray stripes are to add definition. Right. It’s not like I stupidly cut out every single other piece first and left the outside of the bag for last and ran out of fabric. And then tried to piece a gray piece into it and then discover that it was still too small. No, no, no. So the purse is basically made in three chunks. 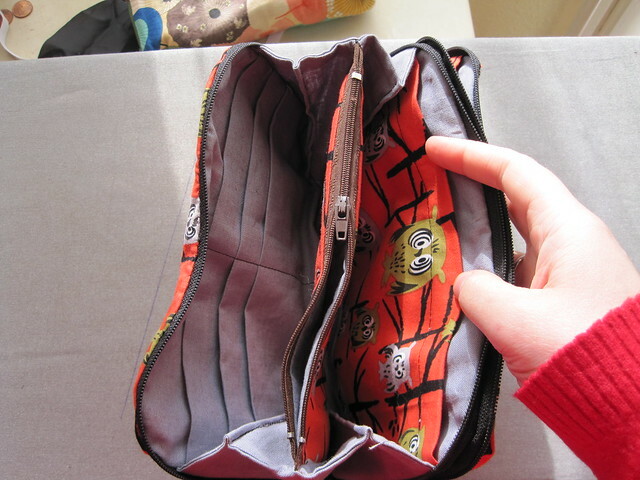 The bag has two sides, one for money, change , cards, receipts, etc, which in the tutorial is called the “money side”. The other side for mainly health and beauty things like tissues, medicine, pens and paper, etc is called the “medicine side”. 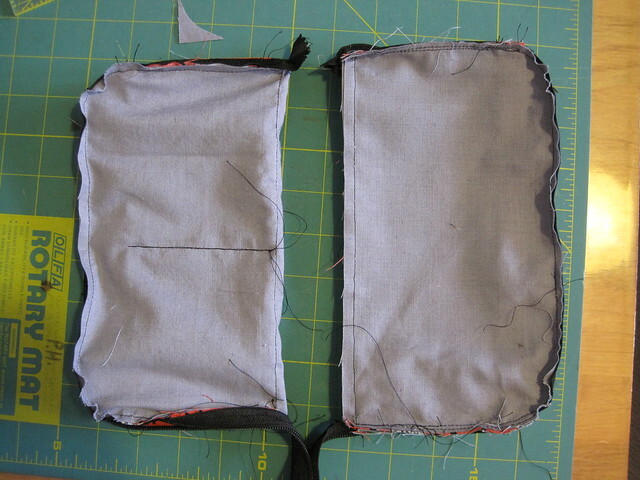 Each of the two sides are made separately and has its own zipper put in. 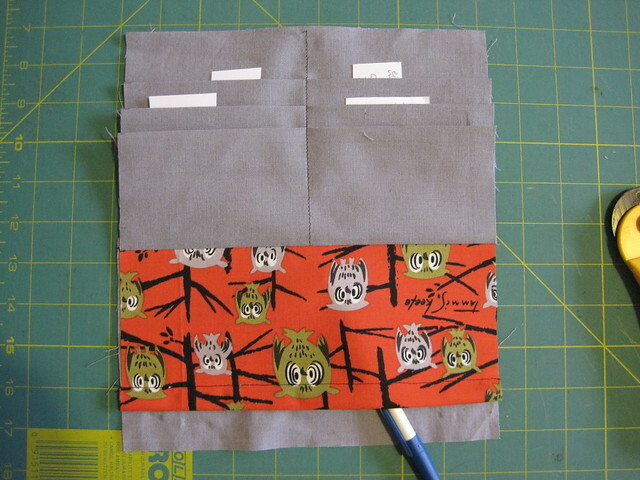 Then the two parts are joined and the outside of the bag is added. We’ll deal with the easier side first: the medicine side. You’ll need four pieces: the strap piece, the medicine side lining, the velcro pocket and the elastic pocket. First fold the strap in half and sew down the long edge. Turn right side out and press. Cut off two pieces, each about 2″ long – these will be the pen holders. Set the longer piece aside – this will be the wrist strap and we’ll only need it in the final step. In the picture below, see the pencil marks? Those are a half inch apart, in the center of the bag. That’s the bottom of the bag. I marked them on both sides of the bag. 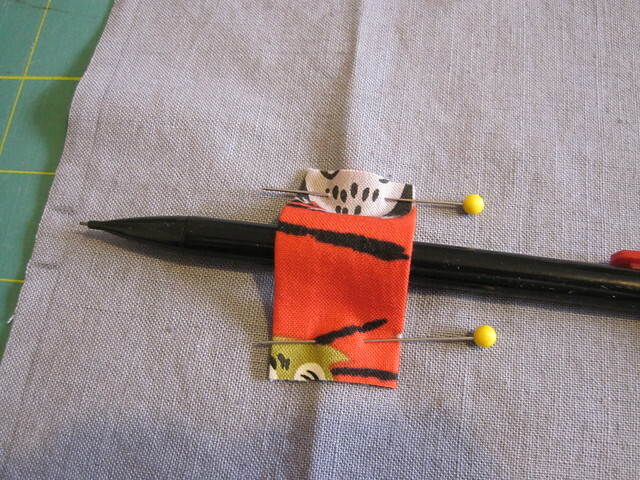 Then I pinned my pen holders in place. 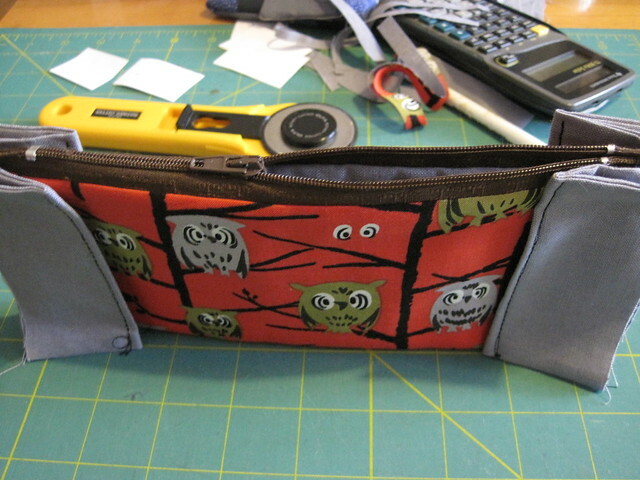 Next I attached the velcro pocket. 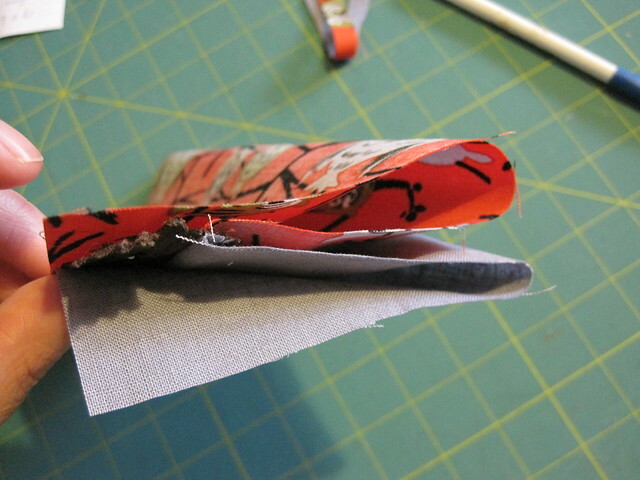 Before attaching it, I folded over the top edge and sewed one side of the velcro down. As you’re sewing it, you should be sewing down the line between two of the pencil marks you just made. 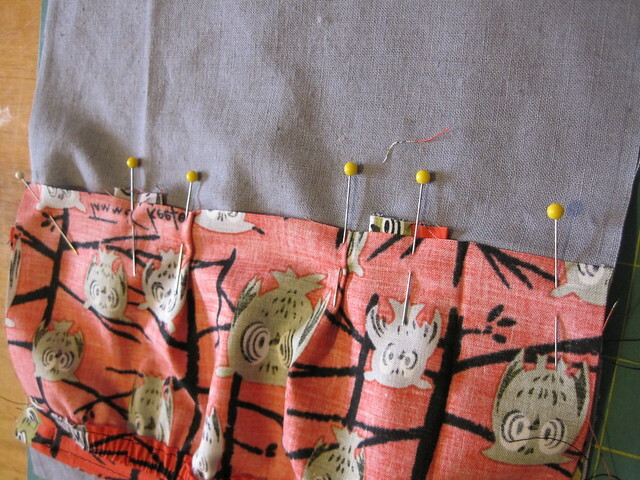 This means that the edge of the pocket fabric should be a quarter inch away from the pencil marks. In the picture below, you can see what I mean by looking at the bottom right corner of the red pocket. 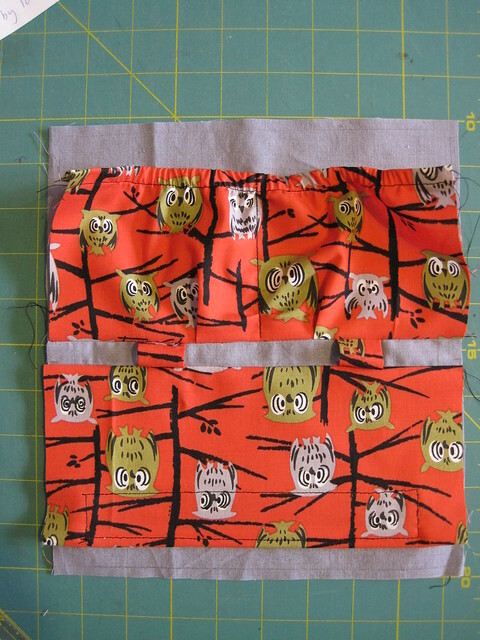 After sewing, flip it up and press, then sew the other side of the velco to the lining. 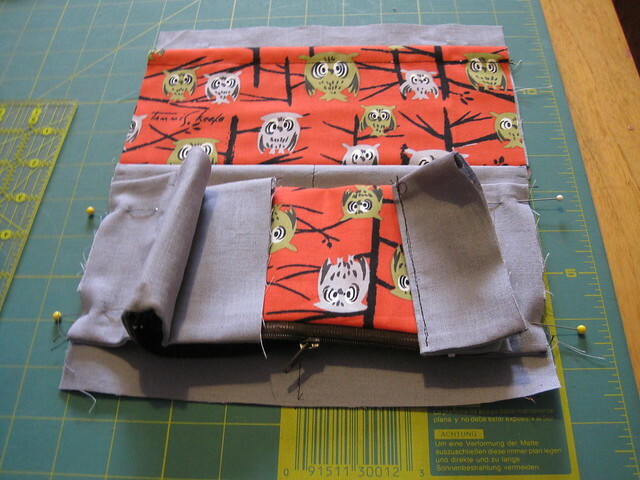 Repeat the process on the other side with the elastic pocket. The difference here is that the pocket is bigger. At the top, this extra is taken in by the elastic. 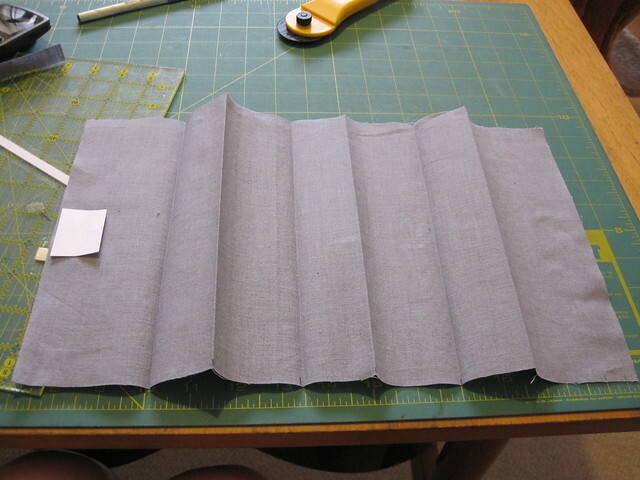 On the bottom and at the sides, you should make one or two tiny pleats to take in the extra fabric. Again, flip up and press. 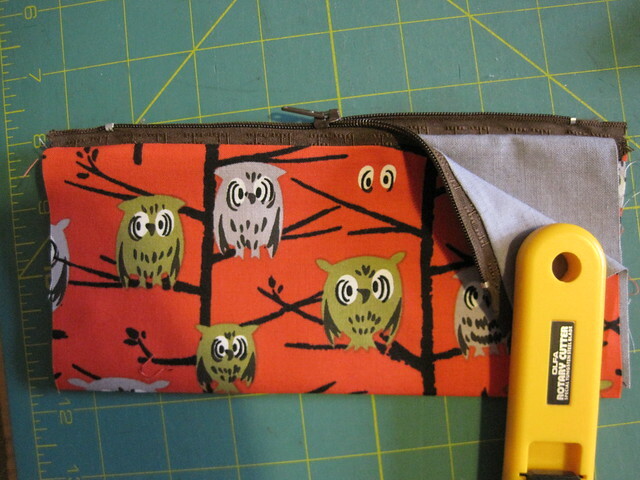 I also added a line of stitching down the middle to divide the pocket into two. 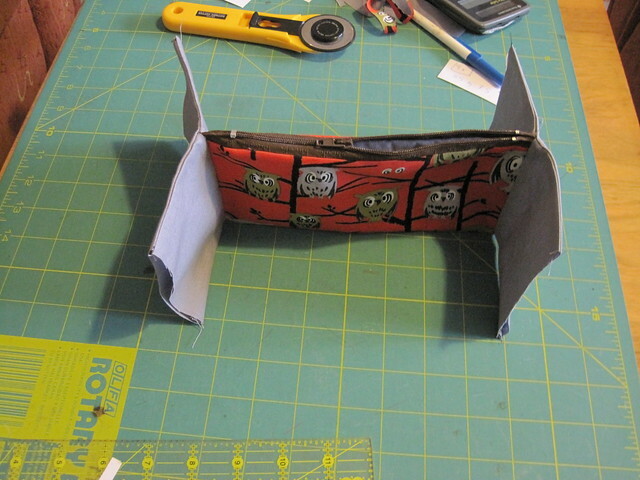 Round the corners of the bag, if you like, and attach the zipper. 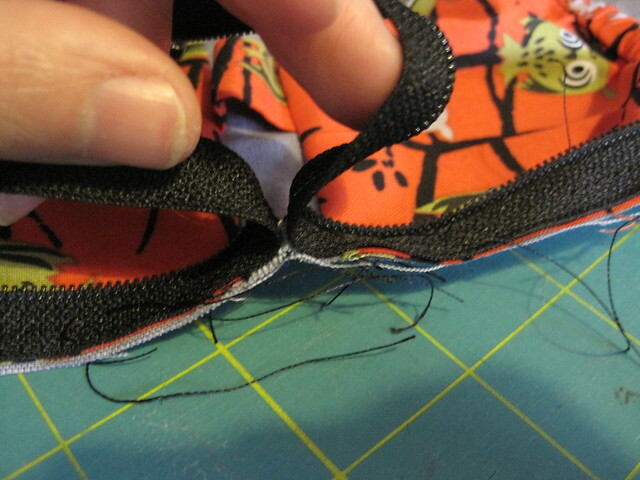 You’ll be sewing the back side (wrong side) of the zipper to the right side of the fabric. The tricky part here is getting around the curves: just clip a lot, and pin a lot. Way more than this pictures shows! 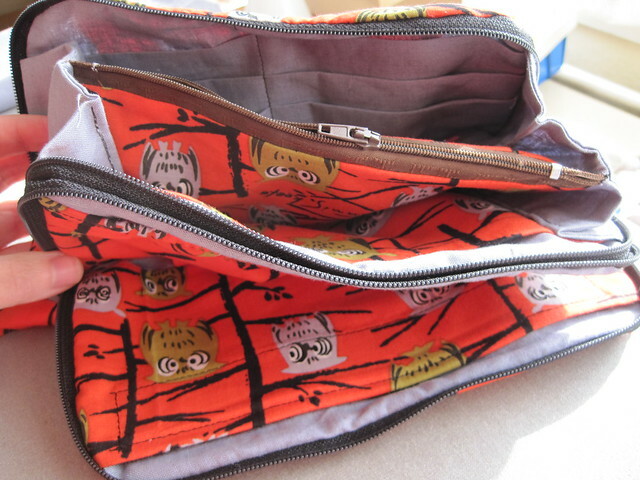 At this end of the zipper, just sort of smoosh the ends down and sew over them. I mean, fold them properly down and out at a 45-degree angle. 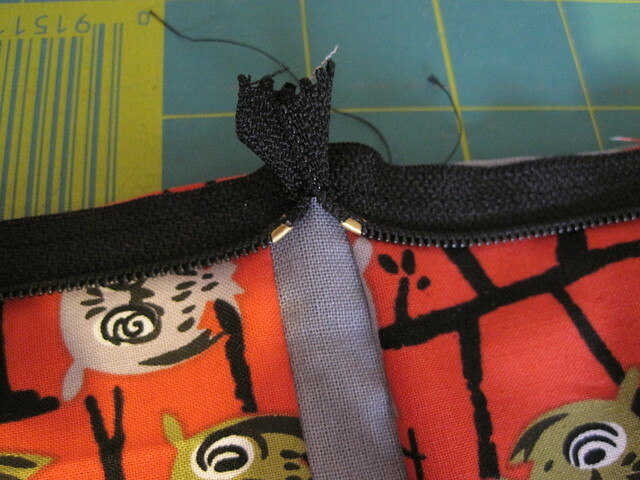 At the other end of the zipper, you can’t sew over it (if you do, you won’t be able to zip it up). 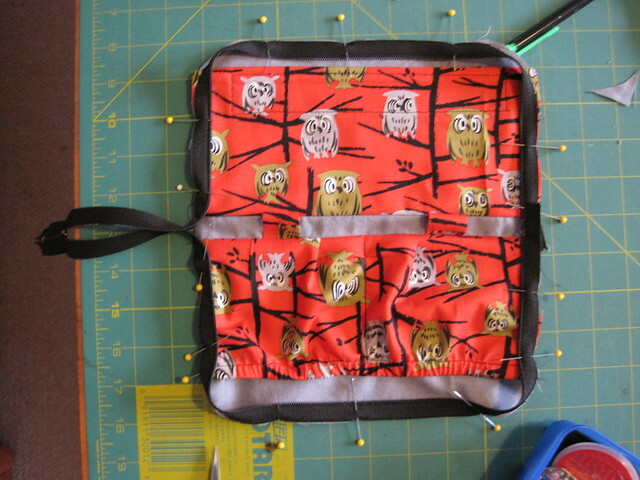 Sew right up to the center of the bag, then backstitch to secure. Repeat with the other side. 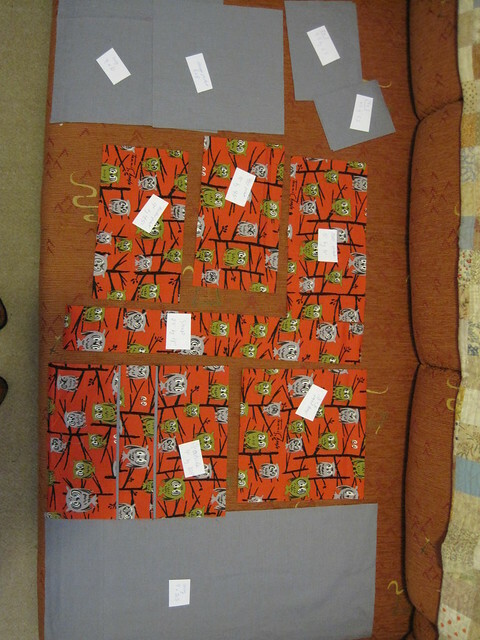 After folding and sewing down the middle to secure, the section should measure 9″ by 5.5″. 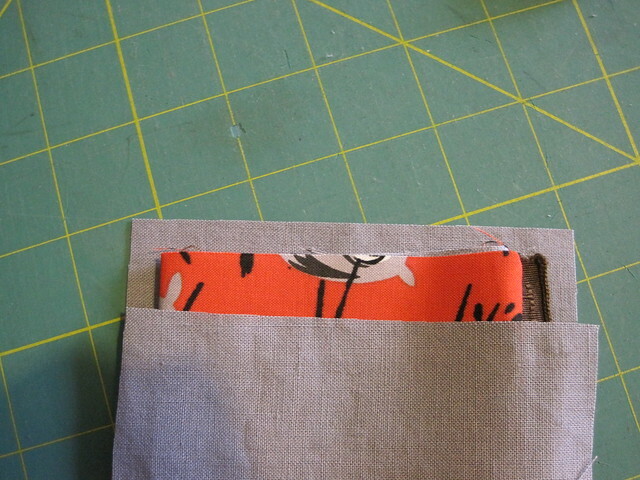 At the bottom, sew the other lining piece as well as the divider pocket. 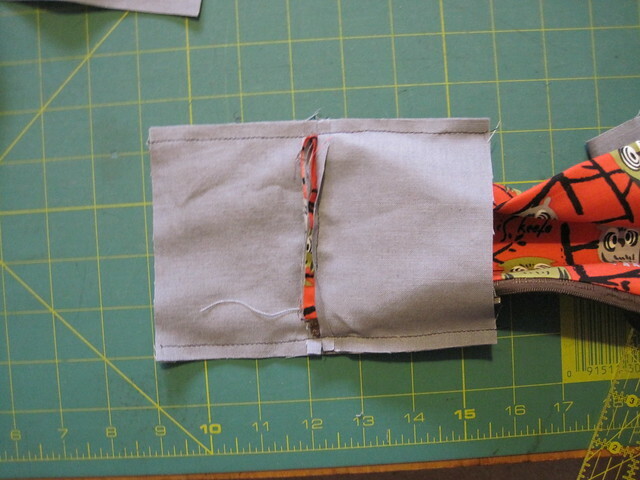 Before doing this (or after, if you forget, ahem), hem the edge of the divider pocket by folding over once or twice and stitching down. 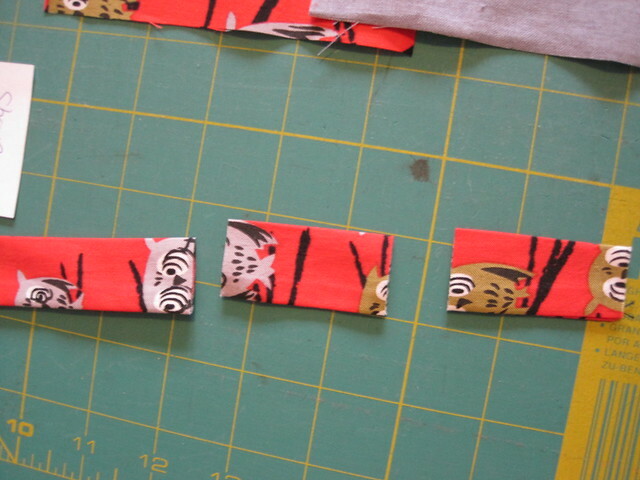 Next, take those four smaller rectangles you cut and line two of them up with the end of the tube. There should be a quarter inch of overhang on either side. Sew them up, and repeat at the other end. Press these seams open, as much as possible. 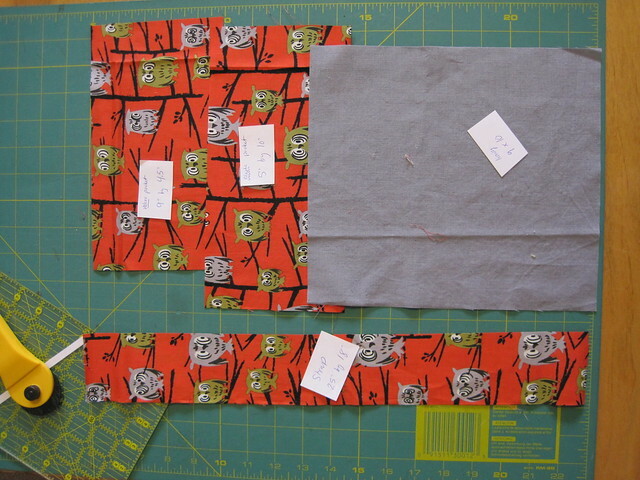 Now you’re going to sew the other two rectangles to what you just created. 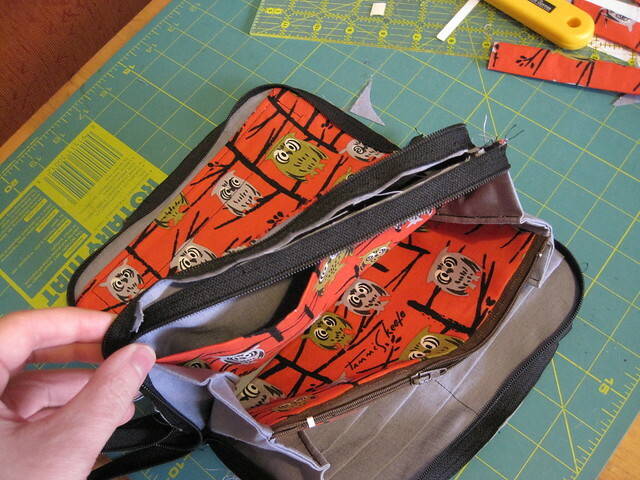 The only trick here is keeping the zipper-tube-part out the way while you sew. Turn the whole thing right side out, give it a good press, and you’ll end up with this H-shaped thing. 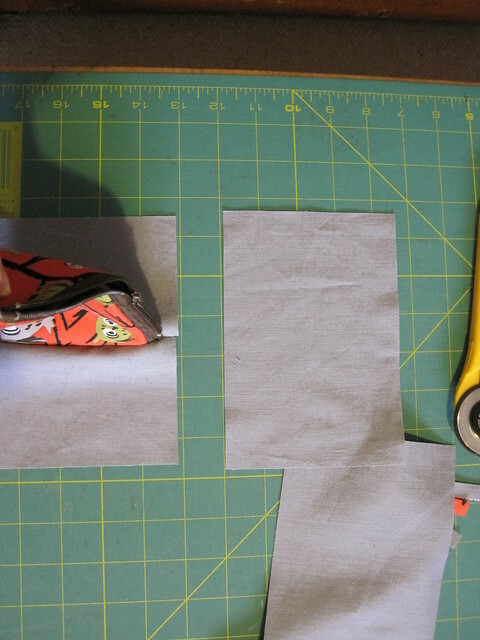 Add some definition by folding over the folds and sewing them down. 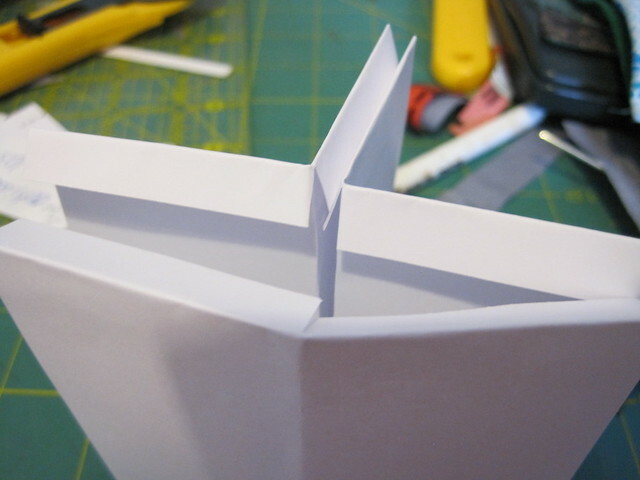 This fold line should be 1.75″ from the outside edge (the unfinished edge). 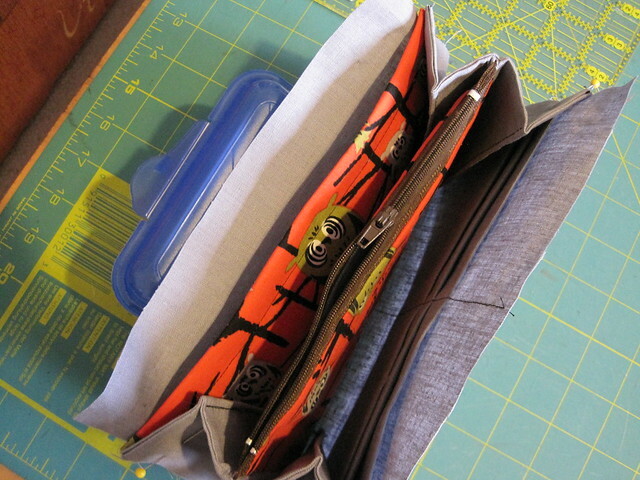 Now you can pin the change purse into the bag and baste it, either sewing or just pinning. 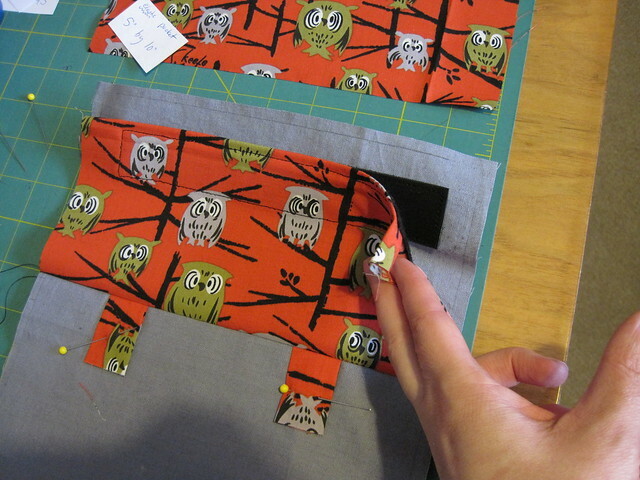 Round off the corners and add the zipper just like you did to the other side of the bag. This side is a bit harder because you can’t open it up flat, but just pin a lot and take your time. Part three: joining the two parts and finishing the bag. This is hard to see in the pictures, and because it was hard for me to visualize how the three pieces would come together, I made the following little mock-up from paper. Imagine that the two pieces folded are the two sides of the bag, and the piece at the bottom is the outside of the bag. The narrow, folded over parts are the seam allowances. Again: in theory, very easy. In reality, not so much, because there are multiple layers of fabric and the zippers. But you’ve done all the work so far, you might as well finish it off. First, join the two inside pieces. Imagine (or actually mark) those red dots from the drawing above on the pieces. Stop and backstitch here. Then add the outside of the bag. Easier typed than done, that’s for sure. Three important things to remember: One, add the strap somewhere. Two, leave a hole for turning the whole thing right side out. 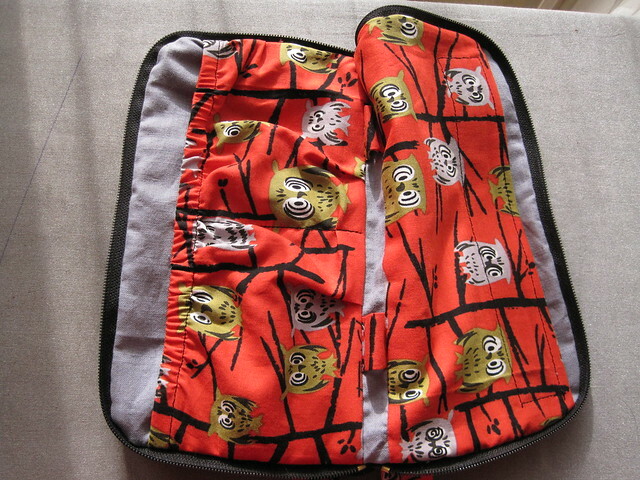 Three, when you sew over the long tails of the zipper, they have to be partially closed! 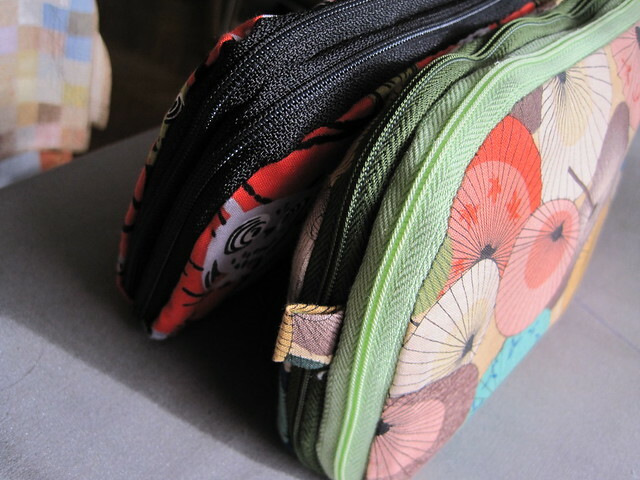 Otherwise you’ll end up with the zipper heads sewn into the lining of the bag. 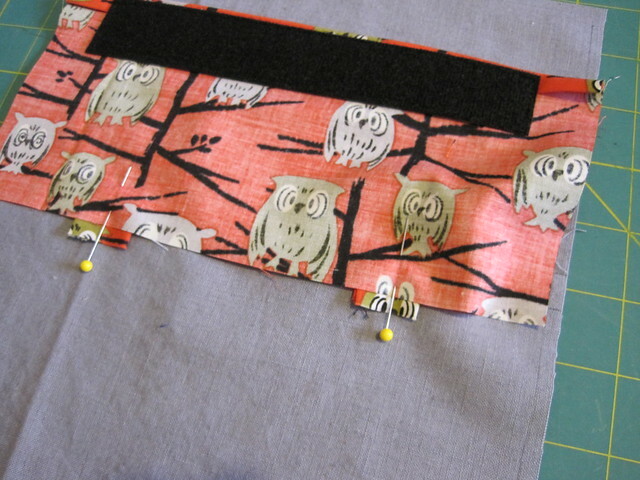 Meaning the zippers will be a nice decorative edging, but totally useless. And then, finally, when you make it around, turn it out, hand sew up the hole: here comes your big ta-da moment! 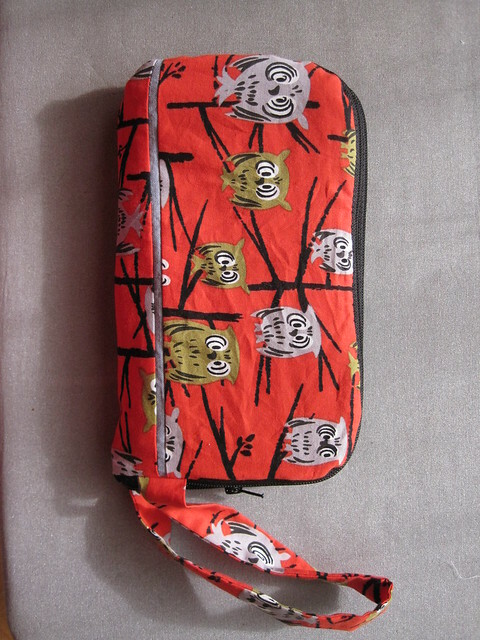 This entry was posted in sewing and tagged pattern, sewing, sewing, tutorial, wallet. Bookmark the permalink. 3 Responses to The Everything Wallet – tutorial! wow, very awesome. Thanks for sharing!